These three maps illustrate the significant growth in BSN-prepared nurses across the nation from 2010 to 2017. 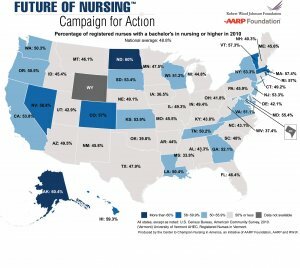 They were created by the Center to Champion Nursing in America, which coordinates the Future of Nursing: Campaign for Action, both initiatives of AARP Foundation, AARP and the Robert Wood Johnson Foundation. This map highlights the percentage of registered nurses with a bachelor’s degree in nursing or higher in 2010 by state. This map highlights the percentage of registered nurses with a bachelor’s in nursing or higher in 2017 by state. 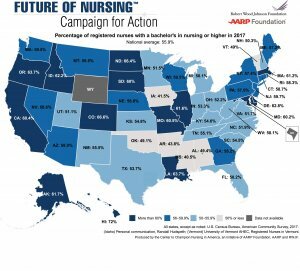 Displaying this map after the previous map powerfully depicts the national trend of more nurses earning their BSN. 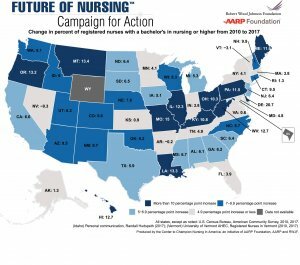 This combined map depicts the change over time in percentage of registered nurses with a bachelor’s in nursing or higher from 2010 to 2017 by state. Note: These maps use American Community Survey data to depict the national trend. States who collect their own workforce data may find the state numbers in these maps may vary from their numbers, and therefore may prefer to continue to share their state-level data.